Lunch + Fun = Bento! Add some cuteness to your lunches with these adorable bento box recipes. By combining traditional Japanese bento style with familiar Western foods, you get the best of both worlds! Colorful, creative, and fun for the whole family, bento lunches are the perfect way to encourage healthy eating by making good foods look even more appealing than junk. So go ahead—open up your lunch box and play with your food! With Happy Bento in hand, you can say good-bye to boring lunches and hello to healthy, happy food! 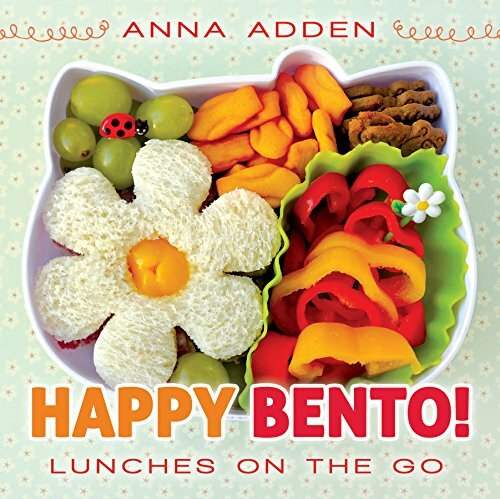 My children stole this cook book as soon as it arrived and were busy making shopping lists from the recipes inside Happy Bento. So far we’ve packed a shark and Alice in Wonderland bento to go. Let me tell you we are in love. The author has put together such a wonderful little cookbook with great ideas for school lunches and picnics. It is user friendly, has colorful photos and a small compact paperback size. All of the ingredients were easy to find and yummy, the lunches nutritious. We enjoyed Anna’s ideas. We packed them on our field trip in fun vintage tupperware containers with cupcake liners. I even ate a sliced raw pepper for the first time! Yes and yes– go get this one.